A droll, all-too-plausible contemporary thriller pulls a mismatched trio of stressed-out 30-somethings into underground guerilla warfare against a sinister conspiracy to own the information superhighway. On one side of the world, you have Leila Majnoun, an increasingly jaded operative for a global nonprofit agency struggling to do good deeds despite the brutal, stonewalling autocrats who run Myanmar (Burma). On another side is Mark Deveraux, a self-loathing self-improvement guru living a glamorous and debt-ridden lifestyle in the promised land of Brooklyn. Somewhere in the middle (Portland, Oregon, to be precise) is Mark’s old school chum Leo Crane, a misanthropic poor-little-rich-kid grown into a trouble-prone, substance-abusing and seedily paranoid adult. The destinies of these three lost souls are somehow yoked together by an international cabal of one-percenters who want to create something called “New Alexandria,” where all the information available (or even unavailable) online will be in their money-grubbing control, thereby making the recent real-life National Security Agency abuses of power seem like benign neglect. 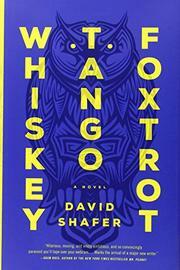 Shafer’s arch prose, comedic timing and deft feel for shadowy motives in high places are reminiscent of the late Richard Condon (The Manchurian Candidate), only with sweeter, deeper characterizations. At times, you wish he’d move things along a wee bit faster and make his menace more tangibly scary than it is here. But it’s also possible that Shafer is remaking the international thriller into something more humane and thus more credible than what fans of the genre are accustomed to. An edgy, darkly comedic debut novel whose characters and premise are as up-to-the-minute as an online news feed but as classic as the counterculture rebellions once evoked by Edward Abbey and Ken Kesey.